Heavy rain has been falling on the site during the week. Organisers of the Royal International Air Tattoo at RAF Fairford have cancelled Saturday's display after heavy rain saturated the ground. It is the first time the tattoo has had to cancel one of its days in its 38-year history. More than 300 planes were due to take part and 100,000 visitors were expected to attend. 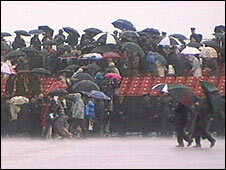 Organisers said the rain had left the car parks and parts of the airfield, in Gloucestershire, waterlogged. Air tattoo director, Tim Prince, said: "It is with great regret that we had to take the decision to cancel the airshow on the Saturday but the safety of the public is paramount. "When it became clear that we could not guarantee the safety of the many thousands of people who had bought tickets for Saturday, the decision to cancel was straightforward. "We are aware of the inconvenience our decision will have on the many thousands of people who have bought tickets for the Saturday, but the potential risk of there being significant difficulties on the roads, in our car parks on the airbase itself were too high." Earlier in the week, air traffic controllers battled to clear a backlog of planes coming in, after bad weather. A tattoo spokesman added: "It is anticipated that the show will be held on Sunday, but it will be only for holders of tickets valid for Sunday. "A decision in respect of this will be announced by 1600 BST on Saturday"
The event started on Friday when the Queen presented new colours - ceremonial flags - to the Royal Air Force (RAF) at its largest ceremony for more than 30 years. The event was due to be opened to the public on Saturday with a display by the Brazilian aerobatic team, the Esquadrilha da Fumaca. 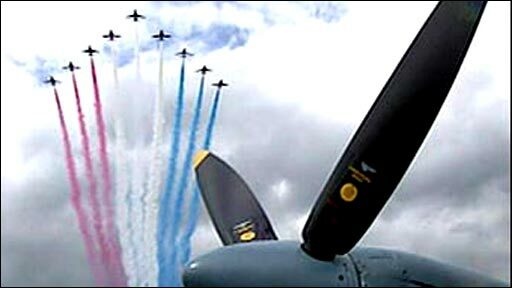 The tattoo is staged in support of the Royal Air Force Charitable Trust, a charity set up in 2005.